What’s up Readers? This is your new UFC and MMA correspondent for Moai Martial Arts. As a fan I was a little late to the UFC game, but watching Rampage Jackson knock out Chuck Liddell at UFC 71 hooked me on the sport. Ever since then I have surrounded myself with combat sports and scoured the World Wide Web to learn about its extensive history. UFC 132 will take place this Saturday at the MGM Grand in Las Vegas. The card is stacked with young talent as well as veterans of the Octagon. 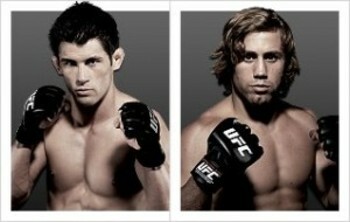 With the details set, take some time and check out my previews and predictions for UFC 132. This lightweight bout should be a showcase for each fighter’s jiu-jitsu skills. Dos Anjos and Sotiropoulos are both Brazilian Jiu-Jitsu black belts and have ended a majority of their fights with submissions. Dos Anjos is coming off a tough loss to Clay Guida at UFC 117. While his opponent Sotiropoulos is coming off his first defeat in nearly 4 years. Viewers should expect excitement on the ground with each fighter seeking a submission victory. This is the classic striker versus wrestler matchup. Fans will remember Guillard for his stint on The Ultimate Fighter 2; he is known for his stand up game and has obtained 16 of his 27 victories by knockout. Roller is an All-American wrestler out of Oklahoma State whose slick submission skills were shown during his tenure in the WEC, gaining 6 of his 10 wins by submitting his opponent. PREDICTION: Roller’s ground game will prove to be too much for Guillard. Roller by decision. Tito is back! …crickets… That statement would have excited me about five years ago, but not so much in 2011. The early face of the UFC climbs back into the octagon against up and comer Ryan Bader. This booking by Joe Silva and Dana White seems like an attempt to unceremoniously end Tito’s career. Bader is a young fighter with outstanding wrestling ability and one-punch knockout power; his only loss comes to current Light Heavyweight Champ and budding superstar, Jon Jones. On the other hand, Mr. Jenna Jameson is winless in his last five fights over a five-year span. PREDICTION: BADER by KO in Round 2, this could be the last time we see the “Huntington Beach Bad Boy” in the UFC. One word. SLUGFEST. Fists will be flying in bunches in this bout. Silva is a vanguard of the sport, being in the fight game since 1996. His relentless attacking style and vicious knockouts have made him an overwhelming fan favorite. After rehabbing from knee surgery, this will be Wanderlei’s first fight since defeating Michael Bisping by decision in February 2010. His opponent, Chris Leben A.K.A. “The Human Punching Bag” is an ideal match up for the aging superstar. Leben is known for his incredible ability to take punishment and his aggressive stand-up style. There should be instant fireworks when these two enter the cage, so expect furious exchanges and a highlight reel knockout. PREDICTION: “The Axe Murderer” himself says that he is in great shape and gunning for the Knockout of the Night bonus, and I have no reason to doubt the former PRIDE superstar. Silva by 1st Round KO. This matchup will be Cruz’s first defense of the UFC bantamweight title. He successfully defended his 135-pound title twice in the WEC, which the UFC recently absorbed. His opponent, Urijah “The California Kid” Faber is a past WEC Featherweight champion and one of the banner athletes of MMA. Faber is known for his relentless motor, wrestling ability, and the overall excitement he brings to the ring. This will not be the first time these two have entered the ring together. Faber handed Cruz his only career loss at WEC 26 in 2007. Cruz may feel like an underdog in this bout due to the heavy support Faber will receive from the fans, but no doubt he will be looking to avenge the only blemish on his MMA resume. PREDICTION: The California Kid seems to be reenergized at 135 pounds, and he is a past champion who knows how to win a title. I see Faber using his stand up to tire and batter Cruz, and subsequently using his wrestling skills to lock Cruz into a submission. Faber by 4th round submission. This entry was posted in MMA and tagged Chuck Liddell, Dominick Cruz, mma, UFC 132, Urijah Faber. Bookmark the permalink. Great analysis alar. Very thorough. Will be interesting to see your prediction winning percentage. Faber is a tough case to crack yet he runs his mouth inexorably and I believe he needs a dose of humility which will be served to him at the end of Cruz’s glove. Vinnie Boom Batz! Wow. Ever hear of Alar’s curse?